The Receive:2 is a compact USB wireless receiver which acts as a hub for the SimplyWorks devices when being used for computer access. It has unique capabilities which enable it to simultaneously support up to six SimplyWorks transmitters of any kind. SimplyWork Receive:2 supports SimplyWorks Trackballs, Joysticks, Switch 125s, SENDs, Keyboards and Switches devices all via a single USB connection to the host computer and without dedicated driver software. 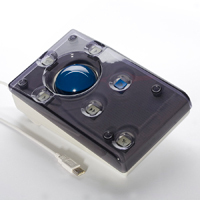 SimplyWorks Receive:2 also includes CAPS and DRAG lock LEDs for easy identification when multiple users are using mouse and keyboard functions. The SimplyWorks system allows you the freedom to create wireless, single or multi-user learning environments, reducing setup time and allowing you to concentrate on the learning tasks themselves. The Receive Micro Wireless Receiver is equipped with a Micro-USB plug that enables it to connect directly to the charging port of many Android-based tablets. 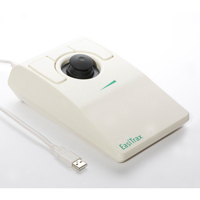 The Receive Micro facilitates communication between the SimplyWorks line of computer access devices and the Android operating system, enabling users to achieve control via Trackball, Joystick, Switches and Keyboard. All of this is accomplished without the need of an App. The Receive Micro forms the hub of the SimplyWorks system and will simultaneously support up to six SimplyWorks transmitters of any kind. 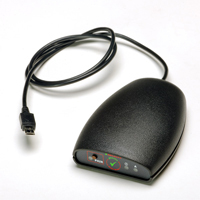 The Receive Micro also includes CAPS and DRAG lock LEDs for easy identification when multiple users are using mouse and keyboard functions. The SimplyWorks integrated control system provides the freedom to create wireless, single or multi-user learning environments, reducing set up time and allowing facilitators to concentrate on the learning tasks themselves. 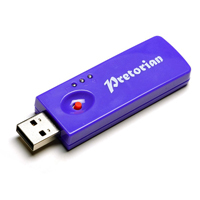 If this is required in a PC or Mac environment the SimplyWorks Receive Wireless Receiver is available. The SimplyWorks Switcher-4 control interface links with SimplyWorks Wireless Switches to provide wireless switch control for up to 4 devices. The included 60" cables provide connection between the Switcher-4 interface and the devices. The compact control module reduces the number of switches required for device control, freeing up space on lap-trays or wheelchairs. 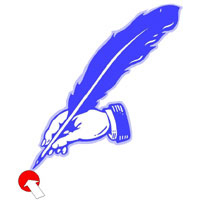 Two modes of usage are available - Single-Switch or Two-Switch. 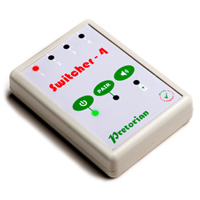 In Single-Switch mode the Switcher-4 can support control of up to 4 single-switch devices using only two SimplyWorks Wireless Switches (available separately). One switch is assigned to select the active device while the second serves for device control. In Two-Switch Mode the Switcher-4 will support control of 2 devices but requires the use of 3 SimplyWorks Wireless Switches, with the first serving as the device selector and the other two buttons serving as input controls. 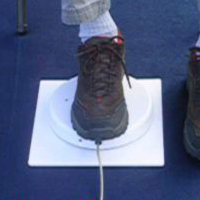 * SimplyWorks is the world's first fully integrated wireless system designed specifically for users with motor skill difficulties.